If you often yearn for 26-hour days — a bit more time to get done all that life requires and maybe, JUST MAYBE, a wink of sleep — this book is definitely for you! Duhigg, Charles. Smarter, Faster, Better: The Secrets of Being Productive in Life and Business. New York: Random House, 2016. Print. Summary: Duhigg maps out the strategies successful people and industries use to attain utmost productivity. Defined here, productivity is ” the name we give our attempts to [best use] our energy, intellect, and time as we try to seize the most meaningful rewards with the least wasted effort.” In other words, Duhigg sets out to teach you how to succeed with less stress and struggle. Critique: Author of the bestselling The Power of Habit (2012), Duhigg returns to deliver a fresh set of neurological schematics underscoring how to get the most optimal performances out of our brains. As always, he does a masterful job weaving technical exposition and compelling scenes involving the many people he profiled and interviewed while researching the book. For example, you may be right in the middle of a based-on-true-events plane crash scene when Duhigg hits the pause button and delivers some bit of crucial data on the brain in times of extreme stress. The suspense mounts and just when you think you can’t take it, he hits play and resumes the gripping drama. The result: reading this book is lot like watching The Big Short. Students studying how to compose creative nonfiction would do well to study Duhigg’s techniques. Besides a good craft study, Duhigg’s latest book outlines some unconventional approaches to productivity all based on the latest behavioral and neuroscience research. Evidently, there IS a wrong way and a right way to make a to-do list. Most of us do it the wrong way, resulting in scads of wasted time, incomplete projects and missed deadlines–not to mention the scree of eroded self-confidence. Also, if you want to get through that nebulous inbox of unanswered emails, you’ll have to learn to reply like a U.S. Marine. Instead of setting the usual SMART goals (specific, measurable, achievable, realistic, timelined), set stretch goals. Finally, once you understand why fear is an intrinsic part of innovating new ideas, you can harness it to intensify your creativity and hit your deadlines and benchmarks. In other words, if you’re a writer, you’ll want this book on your shelf. Summary: Imagination heals chronic pain. Meditation reverses blindness. Walking stops the onset of Parkinson’s. Red LED lights heal arthritis or physical disabilities caused by brain defects. Music reverses the symptoms of autism, dyslexia, or ADHD. Sounds like the stuff of tabloid headlines, right? Well, the title is not kidding when it proclaims”from the frontiers.” The only people getting you closer to these seemingly futuristic frontiers are Isaac Asimov, Andy Weir, and James S. A. Corey. Critique: The first chapter is so riveting, you can’t help but worry that the rest of the book will dud. Isn’t that how the bulk of these controversial medical narratives go? Part one: hype. Part two: snore. Fear not with Doidge! Every chapter features a compelling braid of stories featuring innovative researchers, determined doctors, and actively engaged patients (both young and old) who bring about amazing neurological transformations and physical or psychological recoveries. And every chapter effectively outshines its predecessor! Additionally, Doidge’s narratives place you in the skin of someone living with a debilitating brain injury, disorder, or dysfunction. You come away with a more comprehensive understanding and compassionate perspective on what life is like when you share it with these substantial challenges. After centuries of cutting the body up, down, and inside out, medical science and treatment undergo a complete paradigm shift in this book! Doidge provides a veritable cornucopia of noninvasive, non-surgical, and drug-free neuroplastic treatments and therapies for Parkinson’s, MS, autism, reading disorders, blindness, , , , The list goes on and on. The astounding results are backed by research and ongoing studies.The ability of the brain and body to partner up and heal a disorder, injury, or disease thrusts the patient out of the passive victim role, straight into the driver’s seat of recovery. Eastern remedies combine with Western technologies. Mind unites with body. Neurons grow, die, regrow, and grow better than before. The results are nothing short of revolutionary! Read this book if for no other reason than to flirt with wonderment. Dance with the bedazzling. Intimate yourself with the impossible. And perhaps if you or someone you care about lives alongside pain, disease, or disability, this book may help you find a viable route to hope and recovery when all other signs previously pointed to despair. You see that up there? White space. Blank, empty, open page. Writers face (and curse) that every day. “What?” The vast white screen chins at us. Aggressive. Challenging. Mocking. What are we going to put on it? What ideas, characters, settings, emotions are we daring to scrawl on that pristine open void? It’s never easy to face the blank page. But sometimes, when you do, you get in a flow. The rest of the world melts away and your imagination runs utterly wild. Time dissolves and you hear nothing around you in the real world. You are aware of nothing else but the story gushing out of your every pore. You pulse with creation. You are ablaze. Never have you felt so alive, so poised and effortlessly perfect. That flow state is such a nice place to work in, isn’t it? 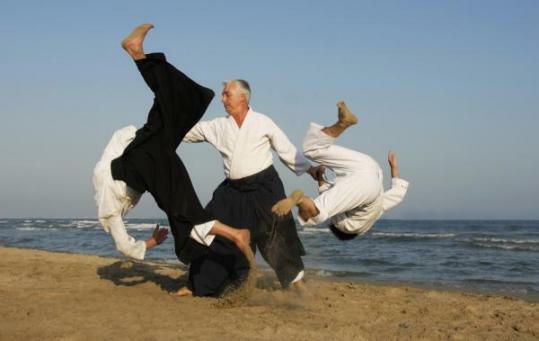 It’s one I savor on the mat at the dojo. 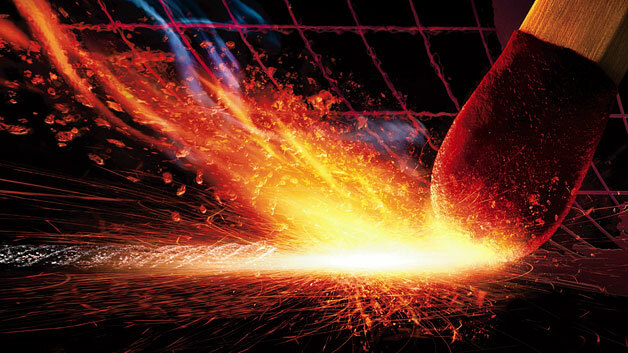 I feel that effortless, flowing, internal blaze when we engage in randoris (multiple attackers) or jiyu wazas (freestyle encounters where you don’t know who is about to attack or how). The world beyond that place, that moment, that next inhalation of air, completely disappears and I am nearly euphoric. I’ve often thought it would be so nice if I could hit that flow every time I sat down to write. Even better: what if I could light that fire as soon as I sat down to write? Oh to be alight with creative fire the moment I open my laptop or journal! Well, recent advances in neuroscience suggest that writers and artists can train their brains to immediately flip that fire switch. Not only that: they can even set their creative fires to a permanently “ON” position. Kind of like a pilot light. So join me on a brief journey into our brains where we’ll not only face the the blank page, but also learn how to go sprinting across it with fire kites of amazing prose and poetry streaming all around, soaking the void in white hot ink! 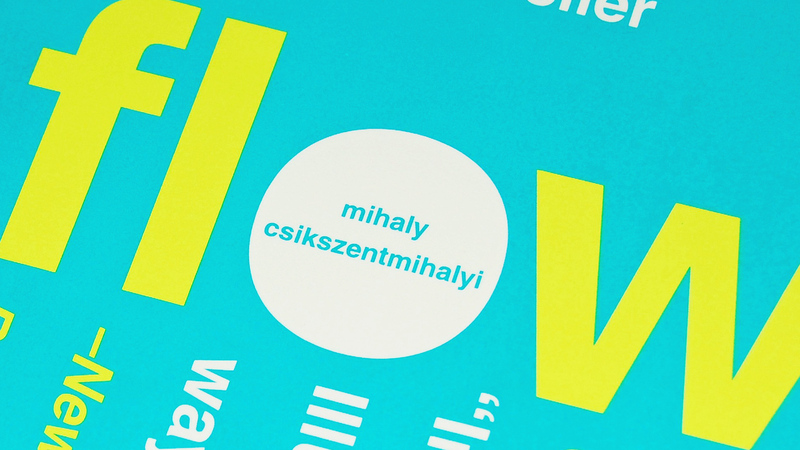 Mihály Csíkszentmihályi (that’s mee-HI chk-szent-mee-HI) literally wrote the book on flow, which he defines as a mental state of operation in which the person performing the activity is fully immersed in a feeling of energized focus, deep and effortless involvement, and enjoyment. The concept of flow has been widely referenced across a variety of fields. According to Csíkszentmihályi, everyone knows the feeling of flow. Olympic swimmers, X-game snowboarders, rock climbers, even chess champions describe flow in the same terms. Regular folks (non-experts or non-pros) who get immersed in an activity also describe flow in the same way, regardless of cultural backgrounds, income, or age. I first heard about flow from my brilliant classmate and fellow Wingbuilder, Ashlee Glasscock. In fact, her graduate lecture was all about how writers could use the flow state to defeat procrastination. Leapfrogging from Ashlee’s shoulders, I want to examine how writers can train their brains to flow so that the writing comes electrically fast and supernova hot! You see, attaining flow is not easy. Csíkszentmihályi notes that evolutionarily, flow is a bad state for humans to enter. We evolved to have quick-cutting brains that continually chatter and mumble as they take in information here, there, everywhere (because you never know what’s lurking and waiting to make you its dinner)! If you focus so intently on something that the rest of the world melts away from your awareness, then odds are pretty good a saber-toothed tiger is going to eat you. Compared to those old saber-tooth predator days, the modern world pretty tame. But the brain prattles on. And its eternal nervous chatter distracts and stresses us. It compels us to multitask. It nags us. It interrupts a perfectly good train of thought to — oh dang, I forgot to order more tea. But lucky for us, the brain’s wiring is plastic, meaning it can change constantly. We can rewire our brains to chatter less and focus more. Image from Aspen Charm Cakes & Pastries. A yummy way to think of the brain (for zombies and non-zombies) is to imagine two hunks of angel food cake. Squish these into two lumpy blobs about the size of your fists and place them side by side. Next, envelop those cake lumps in pliant fondant. The angel food cake represents the white matter, or the fatty tissues that connect the left and right sides of the brain, ricocheting information back and forth. 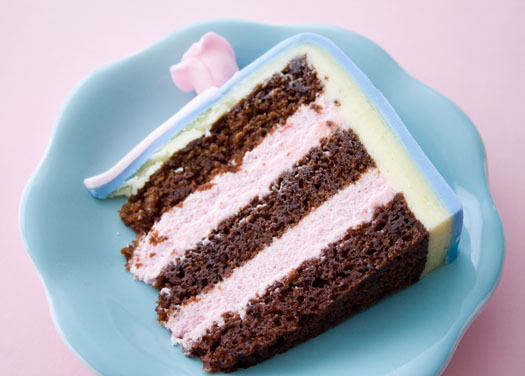 The fondant represents the gray matter, which is where the brain transacts the majority of its thinking and processing of all that information. Like fondant and all its billions of densely packed sugar particles, gray matter is densely packed with cells called neurons. In his 2011 TED Talk “A Map of the Brain,” Dr. Allan Jones estimates no less than 86 billion neurons. Neurons are hairy with wires called synapses that connect and “talk to” other neurons. At any given time, one neuron can be connected to at least 10,000 other neurons, says Jones. To operate efficiently, your brain maintains a use-it-or-lose-it policy. Not consulting that area of gray matter where you stored high school French lessons? Kiss it good bye. The brain will prune it out. To save your neurons from the pruning, you need continual learning. New challenges, new information, new anything allows the brain to continually connect more and more neurons. So long as neurons stay connected, they do not get pruned out. Spent too many decades thinning your gray matter? Don’t worry: your brain can actually grow it back! This ability to generate new neurons and new connections is called plasticity. In the September 2014 issue of the Journal of the American Academy of Child and Adolescent Psychiatry, a team of New England-based researchers published findings on how adolescent brains developed thicker areas of gray matter in response to regularly playing musical instruments. Other studies have found that artistic activities like dancing, crafting, sculpting, etc. also bulk up the grey matter. 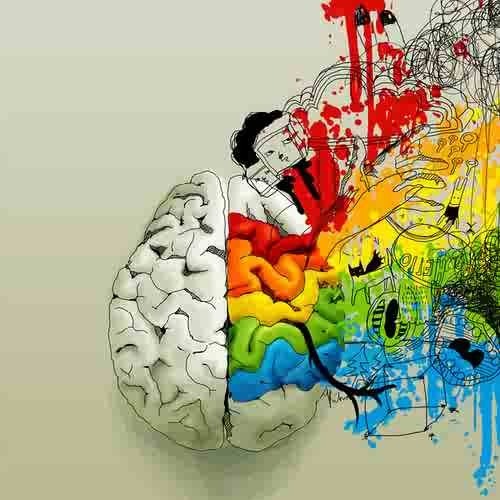 In a June 2014 study, German researchers found that connectivity across the brain’s gray and white matter was significantly improved with participation in artistic activity. Led by Anne Bolwerk of the Friedrich-Alexander-University Erlangen-Nürnberg, the researchers used fMRI to observe brain activity in 28 retirees aged 62-70 years old. One half of the subjects participated in an art class where they actually drew or painted, while the other half took a class where they would only be observing art. Bolwerk and her colleagues found that the retirees who actually made art had better brain connectivity/plasticity than those who just looked at art. Bolwerk suspects that a better brain is one regularly exposed to the kind of focused immersion usually associated with creative activities. Training your brain to flow ultimately makes it a better brain AND a brain better able to flow! When you flow, you are maximizing the functions of your white matter, harmonizing the left and right sides of the brain. The two work as one. With all roads smoothed out for stimuli, the better your brain can focus. The more your brain can focus, the more it is engaged in learning. And when your brain is learning, you are building robust gray matter full of neurons electrically firing! Well, it turns out that the act of sitting down to write doesn’t always fulfill the essential components of a flow activity. According to a flow activity needs to be something you can finish. If I sit down to work on my novel, odds are good I’m not finishing in that sitting. So, to make writing a flow activity, I could set smaller goals: I am sitting down to write 1,500 words…. Image from The Prince’s Foundation for Children and the Arts. Another important facet of a flow activity is the need for immediate feedback. If I were to sit down and work on a craft project, I could hold it up when time ran out and proudly say, “Look what I made!” Polite people who love me would nod, applaud, or otherwise give good feedback. But those people who love me can’t always immediately stop what they’re doing and read what I’ve written. And even if they could, I probably wouldn’t want them to! So what’s a poor writer to do? One thing a writer can do is weave short flow activities into her day. Before your designated writing time, give yourself anywhere from 30-90 minutes to immerse in a bonafide flow activity. If you paint, paint. If you craft with metals or beads, do that. And don’t forget: athletes experience flow, too. So if you bike, go for a ride. Jog? Hike? Walk? You get the idea. Do what you do, but do it with attention and focus. And if, like me, your flow activity takes place at a regularly scheduled class (like martial arts at a dojo, or yoga at the gym), then set up a 30-90 minute writing time to immediately follow that activity. I came to page on fire! My pen sliced up page after page. Or my fingers hit the keys and didn’t stop until my timer went DING! (I use the tomato-timer, AKA pomodoro, method which forces me to take much needed breaks.) Exhilarating. Satisfying. Productive! Now, if you don’t count yourself among the “artsy,” “crafty,” or “mountain-climby” types, fear not. 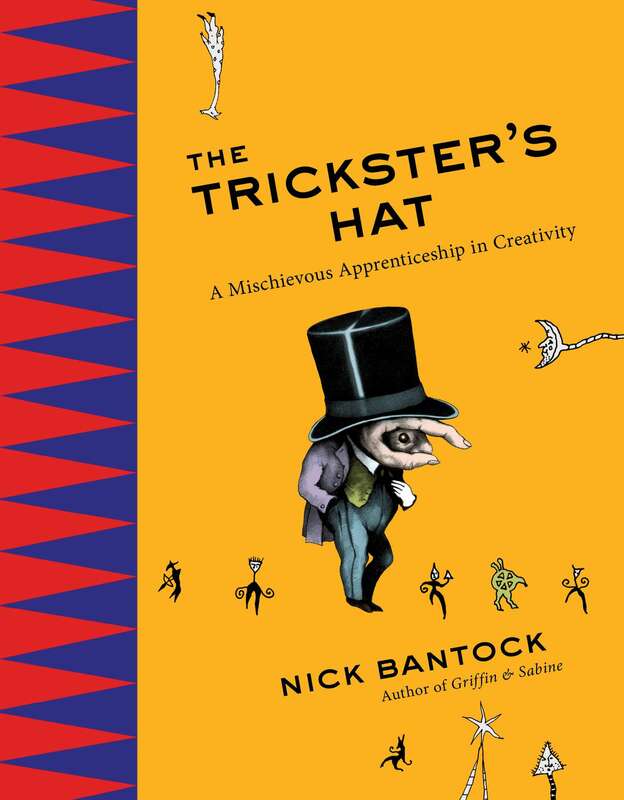 For you, I recommend Nick Bantock’s The Trickster’s Hat: A Mischievous Apprenticeship in Creativity. This book is loaded with timed flow activities designed to supercharge your angel food cake and fondant! Some of the exercises are writing exercises. Some involve art: draw a 1″x1″ box and inside that, scrawl as many animals (stick figures are fine) as you can in one minute! Some are just fun: for no more than two hours, go outside and use only raw materials and found objects to build a tiny village. Okay, off you go! Focus. Immerse. Just be careful where you fly those fire kites! 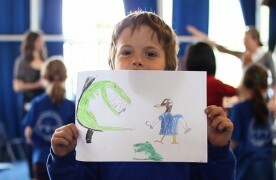 Image from WOBLOG, Inspiration Snooper for Creative Junkies. Recently, I published an article with the Durango Telegraph about recent studies in neuroscience showing how the brain definitely benefits from doing art. Singing, dancing, painting, writing, riffing, you name it! Art stimulates various regions of the young brain, helping it mature, while staving off the atrophy of old age. And, as an added bonus, art trains the brain to focus. Focus does not come naturally to a species that evolved to constantly monitor its surroundings for dangerous saber-toothed predators. However, neuroscience continues to show that intense focus, or “flow,” may be the key to less stress, greater happiness, and a much smarter mind! Margaux Newby, 10, loves art. When she is working on a project, she says, “I feel like I am really where I’m supposed to be.” To her, art is a way to express her emotions. What Margaux may not yet know is that artistic endeavors – painting, dancing, acting, sculpting, writing, and so forth – are physically altering her brain. A flurry of recent neuroscience studies has revealed how art benefits the brains of kids, adults and seniors.